If the British Empire was built on the playing fields of Eton, United States world hegemony gets its training in Hollywood studios and advertising agencies. Selling your product, or yourself, by looking sincere is a cultivated American art. Current top US leaders are expert practitioners. In the space of a few days, Samantha Power, John Kerry, and Barack Obama all turned in war-winning performances. Last August 8, on that serious think tank the Charlie Rose show, former acting CIA director Michael Morell said that US policy in Syria should be to make Iran and Russia “pay a price”. Russians and Iranians should be killed “covertly, so you don’t tell the world about it”, he said. Morell proposed that US forces begin bombing Syrian government installations, in order to “scare Assad”. Probably angling for a good job next year, he is on record supporting Hillary Clinton as a “highly qualified commander in chief” and a “strong proponent of a more aggressive approach” in Syria. Wells Fargo or the Federal Reserve: Who’s the Bigger Fraud? The Wells Fargo bank account scandal took center stage in the news last week and in all likelihood will continue to make headlines for many weeks to come. What Wells Fargo employees did in opening bank accounts without customers' authorization was obviously wrong, but in true Washington fashion the scandal is being used to deflect attention away from larger, more enduring, and more important scandals. What Wells Fargo employees who opened these accounts engaged in was nothing more than fraud and theft, and they should be punished accordingly. But how much larger is the fraud perpetrated by the Federal Reserve System and why does the Fed continue to go unpunished? For over 100 years the Federal Reserve System has been devaluing the dollar, siphoning money from the wallets of savers into the pockets of debtors. Where is the outrage? Where are the hearings? Another US-Russian Syria ceasefire deal has been blown up. Whether it could have survived even with a US-Russian accord is open to doubt, given the incentives for al-Qaeda and its allies to destroy it. But the politics of the US-Russian relationship played a central role in the denouement of the second ceasefire agreement. The final blow apparently came from the Russian-Syrian side, but what provoked the decision to end the ceasefire was the first ever US strike against Syrian government forces on 17 September. That convinced the Russians that the US Pentagon had no intention of implementing the main element of the deal that was most important to the Putin government: a joint US-Russian air campaign against the Islamic State (IS) militant group and al-Qaeda through a “Joint Implementation Centre”. And it is entirely credible that it was meant to do precisely that. Aleppo has become synonymous with destruction and “Syrian state-generated” violence among those whose perception of the situation in the war-torn nation is contained within the prism of mainstream media narratives. The NATO-aligned media maintains a tight grip on information coming out of this beleaguered city, ensuring that whatever comes out is tailored to meet State Department requirements and advocacy for regime change. The propaganda mill churns out familiar tales of chemical weapons, siege, starvation, and bombs targeting civilians–all of which are attributed to the Syrian government and military, with little variation on this theme. The purpose of this photo essay and my journey to Aleppo on Aug. 14 was to discover for myself as a Western journalist the truth behind the major storylines in the US and NATO narrative on Syria. What would former Congressman, former Reagan Budget Director, successful investor, and leading advocate for US non-interventionism David Stockman advise a President Trump to do to fix the mess we are in? Stockman joins today's Liberty Report to discuss his new book, "Trumped! A Nation on the Brink of Ruin... And How to Bring It Back." Trump is known as a "deal-maker" -- Stockman offers him a great "Peace Deal" he could make that would save us billions and keep us far safer than we are today. Sounds like a great deal! Forget about those endless meetings between Sergei Lavrov and John Kerry; forget about Russia’s drive to prevent chaos from reigning in Syria; forget about the possibility of a real ceasefire being implemented and respected by US jihad proxies. Forget about the Pentagon investigating what really happened around its bombing 'mistake' in Deir Ezzor. The definitive proof of the Empire of Chaos’s real agenda in Syria may be found in a 2012 Defense Intelligence Agency (DIA) document declassified in May last year. “THE WEST, GULF COUNTRIES, AND TURKEY [WHO] SUPPORT THE [SYRIAN] OPPOSITION… THERE IS THE POSSIBILITY OF ESTABLISHING A DECLARED OR UNDECLARED SALAFIST PRINCIPALITY IN EASTERN SYRIA (HASAKA AND DER ZOR), AND THIS IS EXACTLY WHAT THE SUPPORTING POWERS TO THE OPPOSITION WANT, IN ORDER TO ISOLATE THE SYRIAN REGIME, WHICH IS CONSIDERED THE STRATEGIC DEPTH OF THE SHIA EXPANSION (IRAQ AND IRAN)”. Several weeks ago the mainstream media (MSM) gave saturation coverage to a picture of a little boy pulled from the rubble of Aleppo after his home and family were crushed in what was dubiously reported as a Russian airstrike. 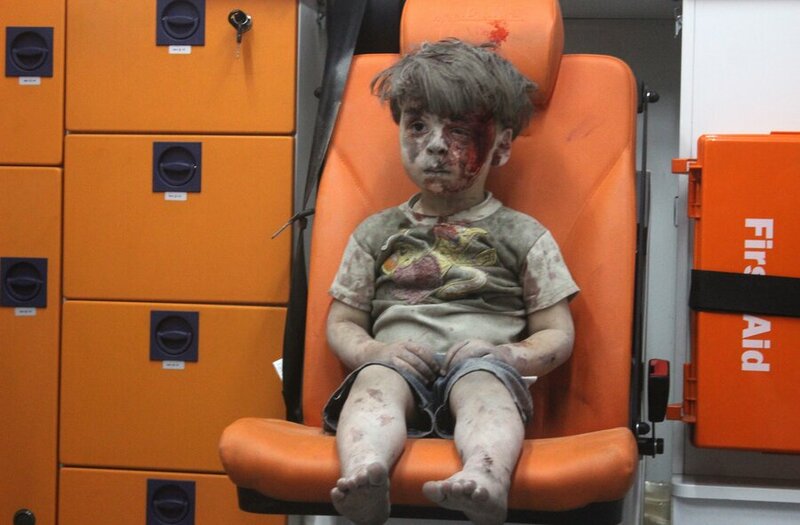 Promptly dubbed “Aleppo Boy,” his dusty image immediately went viral in every prestige outlet in the United States and Europe. The underlying message: we—the “international community,” “the Free World,” the United States, you and I—must “do something” to stop Syrian President Bashar al-Assad and his main backer and fellow Hitler clone Vladimir Putin. The show-down over the damaged aid convoy west of Aleppo is reaching comedy level. The UN/Syrian Red Crescent convoy came from the government held west-Aleppo. It had reached a Syrian Red Crescent center in Umm al Kubra in the "rebel" held area further west where it started to unload. Something happened and many of the trucks burned or where otherwise damaged. Allegedly some 20 people were killed. The incident happened shortly after the ceasefire had officially expired. US sponsored "White Helmet" propaganda teams where there when or shortly after the incident happened. The US and its allies claim that the convoy was bombed in an air attack. The Russians deny that they or the Syrians executed any such attack. US Secretary of State first claimed that the Syrian did it, than that the Russians did it; helicopters had attacked. The Pentagon then came up with two Russian SU-24 fixed wing aircraft as the culprits. But the US then claimed that the attack went on over two hours which is longer than a pair of SU-24 could sustain.